After the Treaty of Versailles Germany was extremely limited in what it could do militarily. It’s martial history and blame for starting the first world war meant that the world was in no mood to see a German with the capacity to grow its army and threaten Europe again. A series of crippling war reparations financially stifling the country and bans on developing military capabilities only for defence meant that Germany would be kept back for decades. The German Generals and Military leaders had other ideas. They had seen first hand the effectiveness of tanks in the World War one and decided that this was the way that war should be conducted in the future. The plans for Blitzkrieg were laid but they needed an Airforce and Tanks both of which were banned. Secret development was carried out under the guise of “tractor development” for agricultural improvement. The Panzer was born. As the Germans developed their Panzers they received help from an unlikely source, the Soviet Union. The Russians quality helped develop the tanks and were later to regret that decision following the start of Barbarossa the invasion of Russia by Germany in the early nineteen forties. Let us look at some of the Tanks that they used. Panzer III and IV – This were the mainstays of the German army and were the back bone behind their Blitzkrieg. They were fast, manoeuvrable yet also more armoured than their Allied counterparts and they were able to overwhelm everything that came before them. The tanks saw action throughout the wat as they were easy to mass produce. Tiger 1 – This was developed as after the Germans encountered the Russia T-34. This tank was well in advance of the Panzer so a more heavily armoured equivalent was needed. Again, this was easy to produce but as the war ground on and the production facilities lost to the Allies they came scare and the Panzer III and IV were relied on more. Konigstiger – Literally King Tiger this was the upgrade to the Tiger and was the most advanced Tank in the field. As the German Army lost ground and facilities were bombed out not enough were produced to turn the tide of the war. 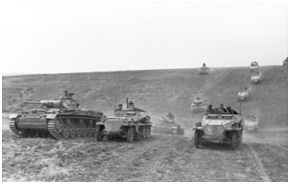 Tank Destroyers – The German army were late to tanks focusing on anti-tank weapons. Many type of Tank destroyers were developed culminating in the huge Elefant. Again, not enough were produced to make a difference.